ROME, Italy (August 1) - Russia inserted four wrestlers into gold medal bouts on the final day of Greco-Roman action at the 2018 European Junior Championships and won two gold medals, bringing their overall tournament total to four gold medals. Aleksandr KOMAROV (RUS) and Artur SARGSIAN (RUS) were the two Russians who were successful in their championship matches on the third day of wrestling in Rome. 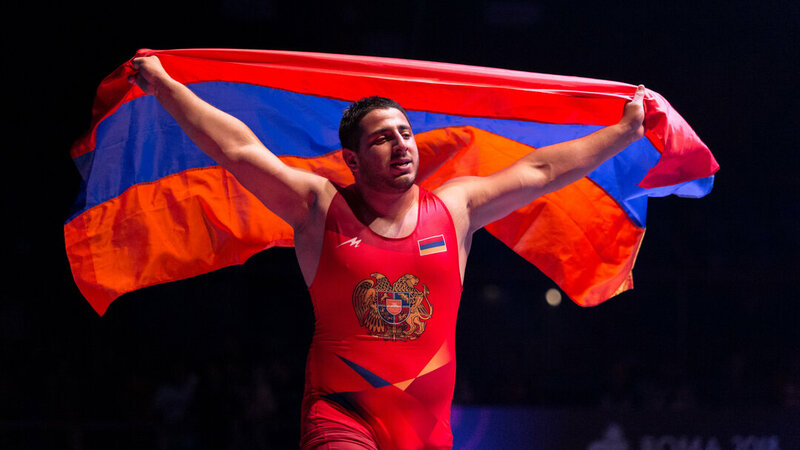 Komarov, the three-time age-level world champion and most dominant Junior in the world defeated Nicu Samuel OJOG (ROU), 5-2 in the 82kg gold medal bout. The four-time age-level European champion trailed 2-1 after surrendering a pair of step outs in the opening minute of the bout. Shortly after, the Russian stopped an arm-spin attempt and scored the match's first takedown, taking the 3-2 lead. Komarov, who remains undefeated on his international career (cadet, junior and senior) scored his second takedown of the match and extended his lead to three points. 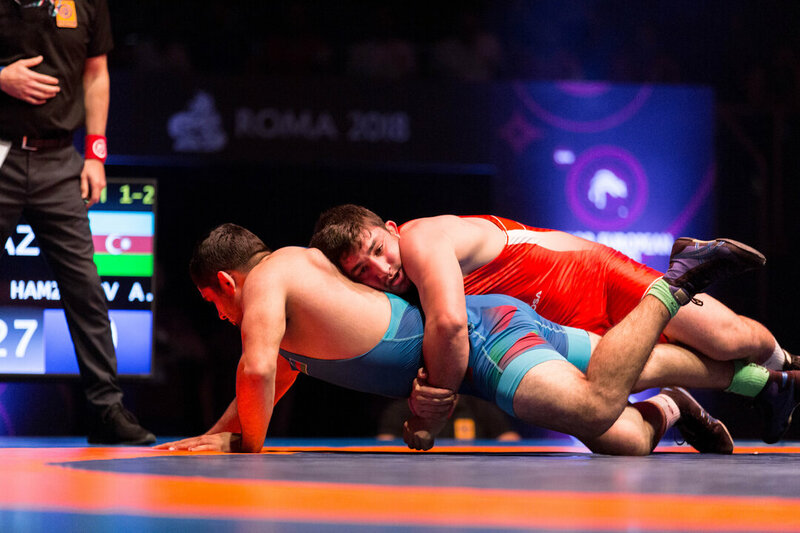 Ultimately, his takedown to close out the opening period ended up being the final points of the bout which give Russia their third Greco-Roman gold medal of the competition. Artur Sargsian gave Russia their second gold medal of the day and fourth overall with a dominating 8-0 shutout performance over Markus RAGGINGER (AUT) in the 97kg championship match. The Russians pace was too high for Ragginger to match, as he bolted out to a 6-0 lead, scoring a takedown along with a massive four points off a throw to end the first period with a six-point lead. Sargsian's shuck-by with 30 seconds left ended the match and gave him his first continental championship gold medal. 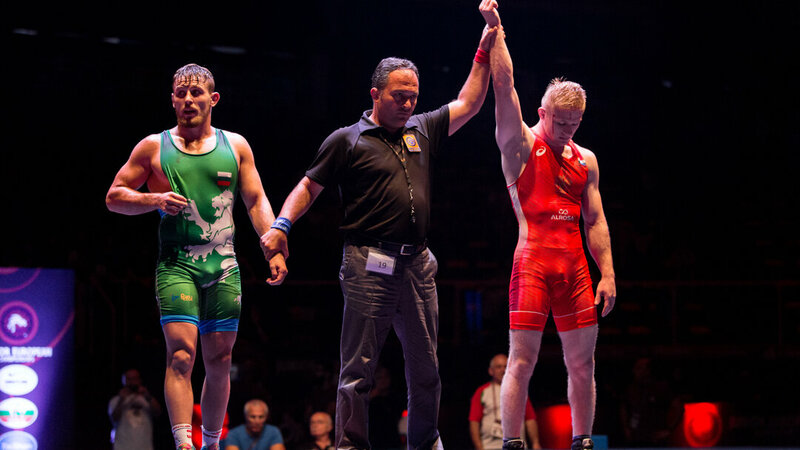 Azerbaijan, Belarus, and Germany won the remaining three gold medals on the final day of Greco-Roman competition. At 60kg, Germany’s 2015 cadet world bronze medalist, Andrej GINC (GER), rolled over Abu AMAEV (RUS), 11-1 to win his second age-level continental medal. Ginc scored the match's first takedown with a head-pinch after back peddling for nearly 30 seconds, ultimately controlling the 2-1 lead. After a short break for clock issues, last year’s European Championship 12th place finisher scored an enormous five-point move, extending his lead to 7-1. He followed that up with a four-point throw, ending the match 11-1 and giving Germany their first Greco-Roman gold medal since Hannes Wagner’s (GER) gold medal in 2015. After giving up the final takedown, Aliaksandr LIAVONCHYK (BLR) hung on to beat Joni KHETSURIANI (GEO), 5-3 in the 67kg finals. The two traded a pair of passivity points before Liavonchyk opened the match up with two turns, taking the 5-1 lead. The action was blown dead, and the finalists were brought up to their feet where Khetsuriani scored a takedown, closing the gap in the score to 5-3. But, time was on Liavonchyk’s side, and he was able to hold on to take the match, 5-3. In the plodding 72kg finals, Ulvu GANIZADE (AZE) and Magomed YARBILOV (RUS) traded passivity points before Ganizade was awarded two points for a correct throw, winning the championship bout, 3-1.